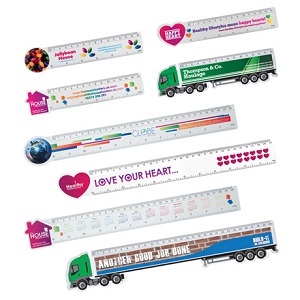 Shaped Rulers 6" - Express Corporate - Promotional Products - Delivered Fast! Product Categories Desk & Office Shaped Rulers 6"
Breathe new life into an office essential with our brand new range of shaped rulers. Four shapes are available, designed for vibrant full colour digital print to allow the shape to complement your brand, product or message. Available with a circle, heart, house or lorry shape, which complement the ruler design, whilst still keeping it as a functional product. Available in both 15cm/6" and 30cm/12" sizes.